Matteo Chiropractic clinic has been providing exceptional care, through outstanding service, quality patient care and education, and advanced chiropractic and physical therapy techniques since 2003. Our goal is to become your first and last stop for all your musculoskeletal problems. Dr. Matteo utilizes spinal manipulation and multiple state of the art therapies to alleviate your pain without the use of medications which come with potential side effects. We provide a professional environment while still making our patients feel at ease and comfortable, answering any questions that they might have about their condition. We are highly experienced in treating conditions such as neck pain, low back pain, headaches, fibromyalgia, arm or leg pain, work place injuries, auto accidents, sports injuries, sprains and strains, repetitive use injuries, disc problems, and postural pain. Moreover, we strive to keep you out of pain and functioning at 100%, through chiropractic care and professional advice catering to the source of your problem, long after your acute injury has healed. So if you're in pain and would like to receive relief the natural and side effect free way then contact us at (919)563-0000. We are currently accepting new patients and there is no charge for consultation. 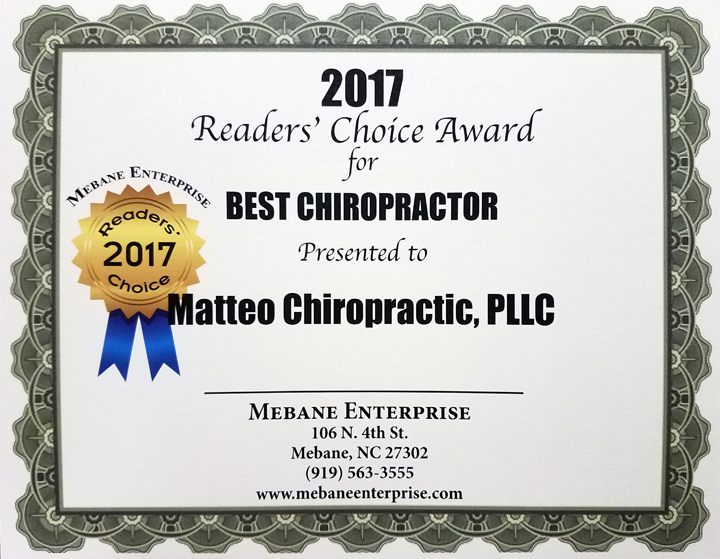 Come see why Matteo Chiropractic was voted best Chiropractor from 2003-2009 by the Mebane Enterprise! Proudly serving the following areas: Burlington, Graham, Hillsborough, Mebane, and the surrounding areas.